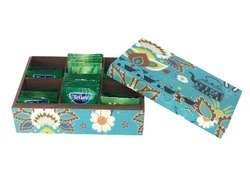 Exporter of a wide range of products which include wooden square tissue box, mdf digital tissue box, mdf wooden tissue box, wooden gift boxes and ethnic tissue box. 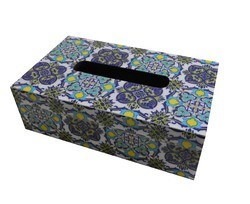 This Tissue box is made of MDF with a MDF Wooden Decorative Tissue Box on the top. Its has beautiful carving on the top which has made it extremely unique and presentatble. It can also be cordinated with matching table tray, coaster and cutlery tray. 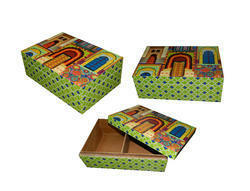 This can also used for gifting purpose during Diwali and other festive ocassions. This can be customised in any size. Similar piece can be procured in Silver finsh also. This Wooden Box is made of MDF. 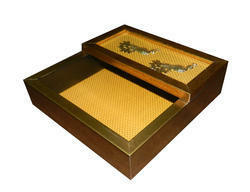 Inner and Upper part of the tissue tray is decorated with Brocade cloth and designer tray. Cloth can be saved from dust and damage by placing a sheet of glass on the upper top. You can avail these trays from us at a a very reasonable cost. 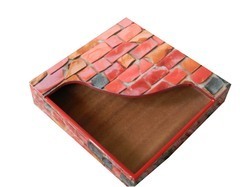 These trays are extremely durable and long lasting. Can also be used for gifting purpose.